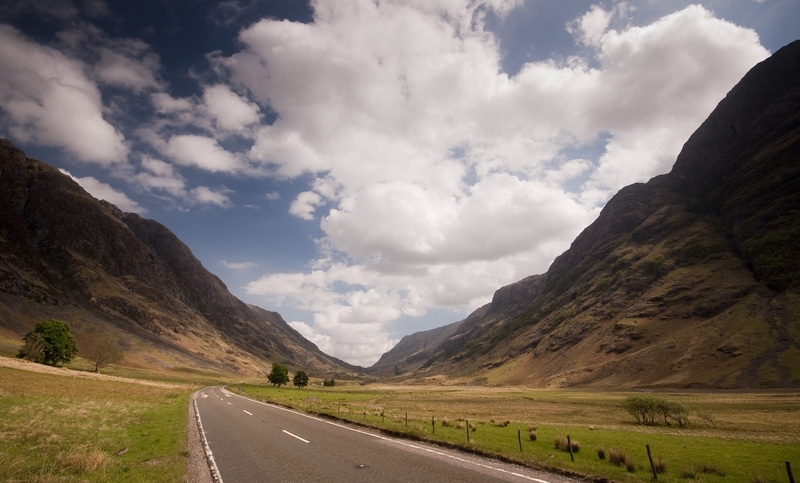 My first suggestion for a car-free break is a really easy way for southerners to see the mountains, glens, lochs, and castles of the Highlands. It only takes a weekend, combines one of the best railway journeys in Britain with two days of 50-60 mile bicycle rides, and if you’re clever with the booking it could cost less than £60 for the whole thing. Londoners get there on the Caledonian Sleeper train, leaving Euston at just after 9pm on a Friday evening (others can board at Crewe or Preston later in the evening). Decide when you want to go (I recommend May, as it’s late enough to have long days, but too early for the midges) and set a reminder for 12 weeks in advance, when the £19 advance train tickets go on sale (prices can rise to over £100 each way when the advance fares run out, and in May the train is liable to be fully booked days in advance, but deciding at the last minute would at least give you the benefit of being able to pick a weekend that you know will be sunny). On the sleeper, you get a bed; a retro lounge car that will serve you breakfast as you cross Rannoch Moor in the morning sunshine, and dinner as you return the next day at sunset; a real old fashioned luggage van for your bicycle; and you get deposited at Fort William ready to start your ride on Saturday morning, and then back at Euston in time for work on Monday. Since it’s only a weekend trip, all you need is a small backpack or pannier to carry a change of t-shirt and pants, your sun cream, and a supply of bananas. Preparation couldn’t be less stressful. 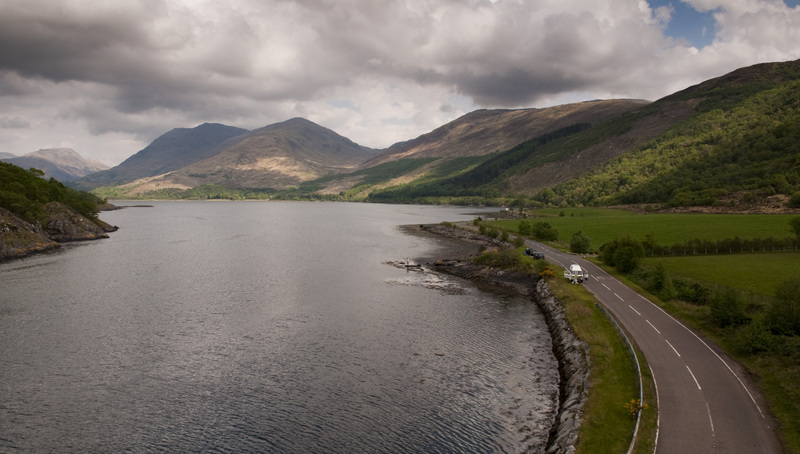 At Ballachulish the road crosses Loch Leven and turns to follow this loch inland to Glencoe village — your last chance to fill water bottles (on a warm day, you’ll want to have two or three litres to get you over the moor), buy packed lunches, or use real toilets for the next 30 miles. The massacre memorial is also only a 200 yard detour if you want to take a look. So far the route has been following the lochs at sea level, but here it turns up Glen Coe itself, ascending for 8 miles to a height of 1,000 feet. The lower portion is on a nice quiet and gentle wooded lane beside the river, but this eventually rejoins the main road beside a lake. The climb takes a while, but there’s no hurry and you don’t need to be a lycra lout to do it: you can take it easy and enjoy the fantastic cliffs and peaks and lakes of the glen as you go, get off and walk if you think you need to (but it’s long, not steep, so you probably won’t), and near the top you’ll find yourself at the perfect time and place to stop for lunch. The day’s ride is mostly flat or downhill from the top of the glen, so you shouldn’t have to worry about the time you spend on the ascent. At the summit of the Glen, the expanse of Rannoch Moor appears before you — a vast and beautifully desolate landscape of peat grasslands and reflecting pools surrounded by impressive volcanic lumps of mountain, with the long and largely straight road gently descending across it on an embankment that gives you constant fantastic views. 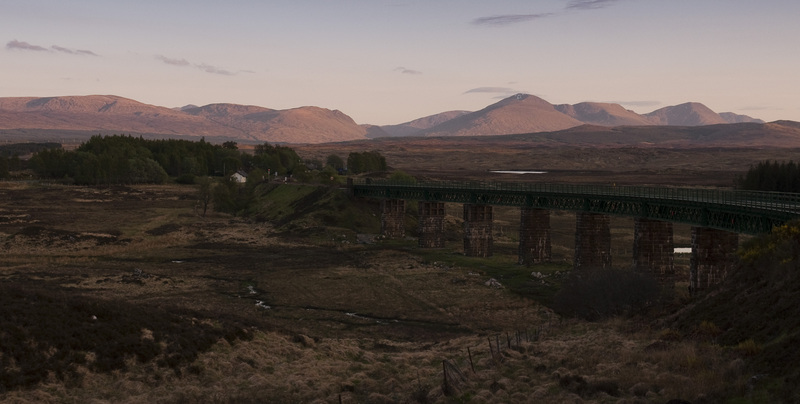 There are ten miles of the moor before the road descends to Loch Tulla and Bridge of Orchy where you can turn off onto the B8074 and freewheel down a further ten miles of Glen Orchy, beside the river, as the evening light shines through the trees. 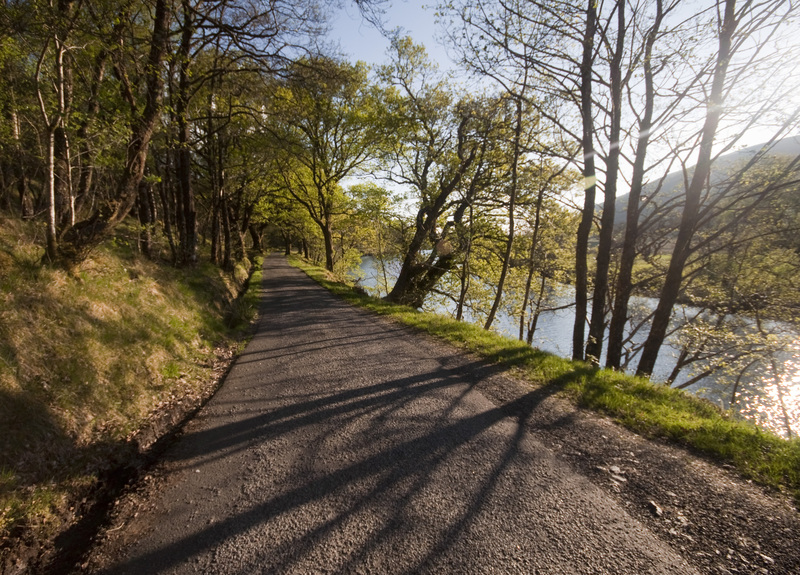 The bottom of the valley, where you join the A85, is a good place to end the journey for the night — Dalmally and Lochawe have food and B&Bs (I can recommend Strathorchy, which has bicycle parking and is very close to the castle). You could easily have enough time at the end of the day (or start of the next) for a quick visit to the monument and viewpoint on the hill above Dalmally, or Kilchurn Castle, or St Conan’s Kirk in Lochawe. On your second day you need to get back to Fort William. The ride is about the same distance as the first day, but follows the coast so is mostly flat, and you won’t need to hurry in order to get back to the station before 19:50. 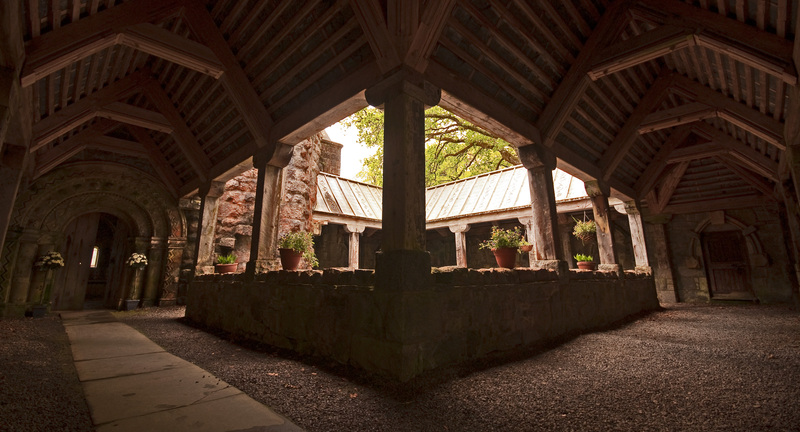 Follow the main road around Loch Awe, past the hydro power station, over Bridge of Awe and down to Taynuilt and Loch Etive, where you can take a short detour for a view up the glen and an old iron furnace if you’re so inclined. At the end of Loch Etive you get to Connel, probably the last chance to buy lunch supplies (the shop is hidden down the lane to the station). At Connel you go under the Connel Bridge, and then turn left onto the A828 to climb up onto the bridge. 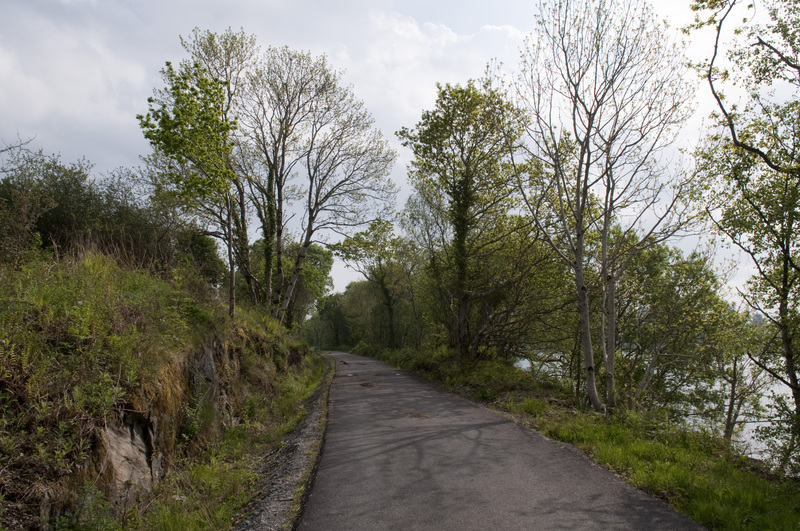 Originally taking a branch of the railway from Connel to Ballachilish, the bridge is now a single-lane road with pavements. It crosses the narrow mouth of the sea loch, Loch Etive, where, when the tides are in full flow, the water tumbles in rapids over the “Falls of Lora” — a sight worth seeing if it’s not too much hassle to time your trip around the tides. 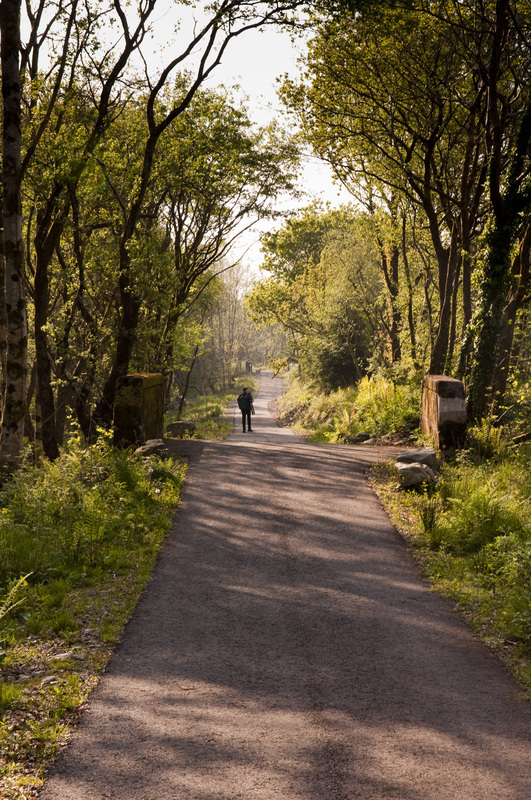 Ballachulish Railway, now NCN 78, a lovely place to ride a bicycle. 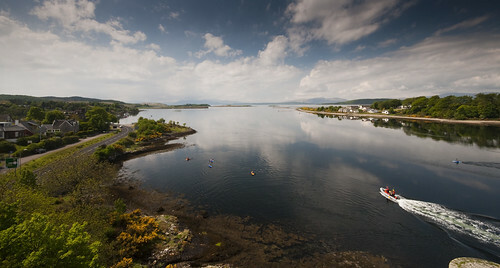 From Connel, you’re on the NCN route 78. Eventually this should be “off-road” asphalt cycle paths all the way to Fort William, with the old Ballachulish railway providing a flat and direct trajectory for much of it. When I did the route in May, only about a quarter of this had been built, but some more should have opened by now. For the rest, you’re on the A828, a quiet road on a Sunday lunchtime. 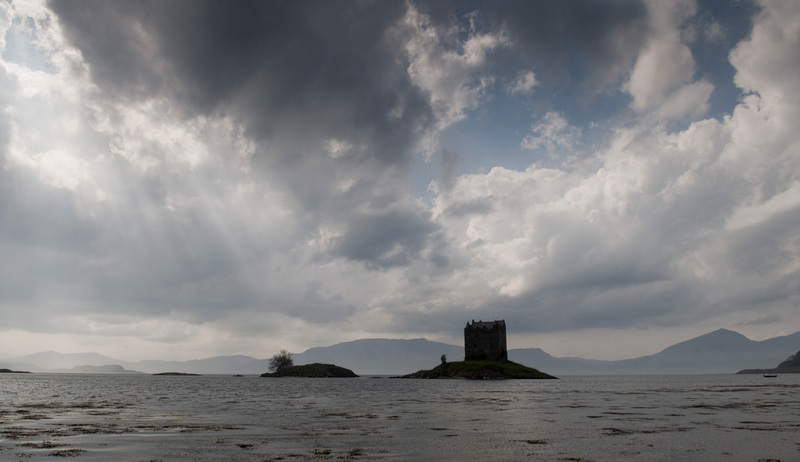 In many places the railway path follows the shore of Loch Linnhe, with great views to the far mountains; and it passes along the waterfront at Portnacroish, with Castle Stalker (of Monty Python and The Holy Grail fame) in the bay. For now, the path leaves you back on the main A82 at Ballachulish for the final ten miles back into Fort William, where you get to relax on the train, with a sunset meal as it trundles over the moor. There are several options for extending this tour, e.g. : instead of getting the train to Fort William, go to Inverness and spend an additional day riding down the Great Glen in the hills above Loch Ness and beside the Caledonian Canal; or, after returning to Fort William, spend an additional couple of days riding north past Glenfinnan to Mallaig and the ferry to Skye, back over the Skye Bridge and a train back from Kyle of Lochalsh to connect with the sleeper at Inverness; or else, take the ferry over Loch Linnhe from Corran (between Ballachulish and Fort William on the return) to Ardgour, stay the night at Strontian and spend a day doing a circuit of the Ardnamurchan Peninsula and back to Fort William via Glenfinnan. This entry was posted in Uncategorized and tagged car-free holidays, cycling, glen coe, highlands, holidays, rannoch moor, scotland. Bookmark the permalink. What a fantastic route with awe-inspiring scenery. I’ve been mulling over ideas for a decent weekend ride away and this is now top of the list. Love the rest of the blog too! Great idea, I am totally up for trying this having never, to my shame, actually having been to Scotland. I take the Night Sleeper down to Cornwall quite a bit and the one up to Scotland sounds very similar – night trains rock. Not only do you get a decent night’s sleep but you get to mess around pretending you’re in an Agatha Christie novel. When was the last time air travel seemed that exciting? !